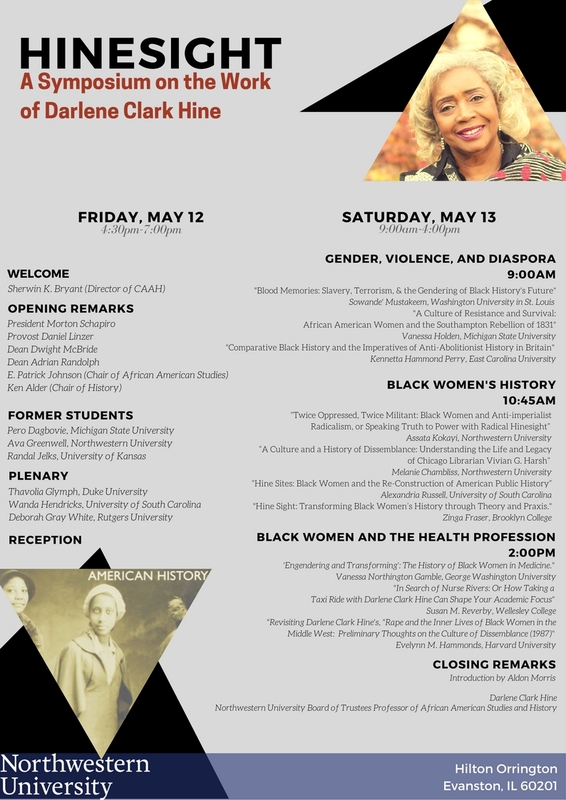 We invite you to join us for a symposium on African American women’s history in honor of Professor Darlene Clark Hine as she retires from Northwestern University. On May 12– 13, 2017, the Center for African American History along with the Department of African American Studies will convene: “Hinesight: A Symposium on the Work of Darlene Clark Hine.” Over the last thirteen years, Professor Hine has served as Northwestern’s Board of Trustees Professor of African American Studies and History. Over the course of her career, Professor Hine has contributed greatly to the institutionalization of Black Women’s History. She has led the way for revisions within Black historiography and American history more generally. It is no wonder that the Organization of American Historians issued the Darlene Clark HineAward for the best book in African American women’s and gender history in 2010 and that she received the 2013 National Humanities Medal from President Obama on July 28, 2014. We would like to take this opportunity to honor her many intellectual contributions to scholarship but also her leadership and mentorship. Her inspiration and guidance of countless students and junior colleagues is both legendary and real. Although foregrounding issues of historical methods and visibility, this symposium will equally embody urgent attention to race, gender, diaspora, and theoretical concerns with scholarly practice to which Professor Hine has devoted her career. The overriding aim of our symposium is looking through “Hinesight”—that is the body of work and her research agenda—to consider her impact upon how we think about Back Women’s History, Comparative Black History, Black Studies, and American History writ large. This symposium will feature a national array of Professor Hine’s former students and collaborators who have gone on to produce their own scholarly contributions. The panels will feature important research that engages with the generative research questions and heuristics that have emerged from Professor Hine’s scholarship. Please RSVP here. Registration is free.